Available for Play: This can be considered available for play. Some nuances may still require vetting. 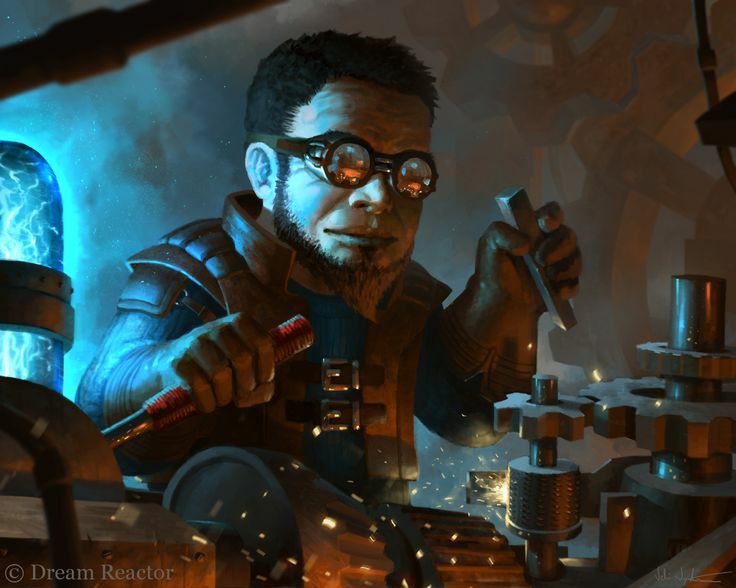 Arcane Tinkerers are people who have devoted their life to understanding the essence of magic and the marvel of engineering, and then thread them together into a perfect fabric that transcends general understanding. When creating an arcane tinkerer the most important thing is which path led you to becoming one in the first place. You might have been a genius engineer who felt like he needed arcane powers to create more fascinating constructions, or maybe you were a wizard who became incredibly interested in the marvelous world of engineering. Once you have decided what led you into becoming an arcane tinkerer, you have to think about what you felt like you wanted to achieve. Do you simply wish to create marvels that fascinate the world. Do you wish to create powerful constructs that can decimate anyone who stand in your way? Or do you simply do it to pique your own curiosity and what you can do with your own intelligence? Once you have decided your path and reason, it is easy to define a general backstory for you character and have a huge amount of fun with the class! You can make a Arcane Tinkerer quickly by following these suggestions. First, Intelligence should by your highest ability score, followed by Constitution or Wisdom. Second, choose the hermit background. Your construct is the very core of your arcane tinkering endeavors. Your construct is used as an arcane focus for your spells and is therefore your most important weapon in battle. Your construct has its turn at the same time as you with its own move and standard actions. As your construct becomes stronger it will also become more sentient. Capable of learning languages, developing free thought, etc. But it will always be bound to its master. The leveling table for the construct can be below. Your construct levels with you, as though it had a class, it gains 1d8 + con hit points each time you take a level of this class, it starts with 8 + con hit points. The construct starts with the following ability scores (ordered in any way you like) 12, 11, 11, 10, 10, 9. It cannot wear armor or wield weapons, it is considered proficient with its own attacks, it uses 8 + its proficiency bonus + its constitution modifier for its DCs. If your construct dies (Once HP reaches negative of max hp) you must repair the construct during a short rest (You do not get the rest as a result of this) Your construct is proficient with two skills of your choice and is also proficient in constitution saves. The construct has a walking speed of 30 feet, and immunity to its disease and/or any effects that would regularly only affect organic lifeforms. Your construct improves as you level, as shown on the table below. The construct has the same ability score restrictions as you (20 by default). A punch attack deals bludgeoning Damage and has a reach of 5 feet. A sweep attack sweeps around the construct in a circle, all creatures in a 5 foot radius must make a dexterity save or take bludgeoning damage. When you gain access to a minor trait you may choose one of the following. Proficient: You may choose 1 skill of your choice to gain proficiency in, you may only select this trait a maximum of 4 times. Language: You learn a new language, you may select this trait multiple times. Sight: The first time you choose this you gain darkvision out to 60 feet, the second time you gain blindsight out to 10 feet. Ice Walk: The construct can move across and climb icy surfaces without needing to make an ability check. Additionally difficult terrain composed of ice or snow doesn't cost extra movement. Overload: Your walking speed increases by 10 feet, you may select this trait multiple times. Arcane Capacity: You gain an additional cantrip spell slot to store inside your construct. You may select this trait a maximum of two times. When you gain access to a major trait you may choose one of the following. Feat: You gain a feat of your choice that you qualify for, you may select this trait multiple times. Ability Score Increase: You gain an ability score increase, you cannot use this on your highest ability score, you may select this trait multiple times. Proficiency: You gain proficiency in 2 of the following saves, Strength, Intelligence, or Charisma. Overcome Resistance: Your attacks ignore resistances. Burrow: You gain a burrow speed equal to your walking speed. Arcane Potency: You gain an additional first level spell slot to store inside your construct. You may select this trait a maximum of two times. Potent Focus: All spells you cast with the construct as a focus gain a +2 attack roll increase. Heal your construct for 1d6+Int Modifier + half of your Arcane Tinkerer level (rounded down) on touch. This heal increases by an additional 1d6 on 5th, 9th, 13th and 17th levels. Your uses are recharged after a long rest. Your wise thinking lets you anticipate your opponents next move and stay one step ahead of them. Add your wisdom modifier to your AC instead of dexterity. Your spellcasting as an arcane tinkerer focuses on imbuing your constructs with magical powers upon crafting them and using that power within to unleash the true potential of your magic. You choose your spells from the arcane tinkerer spells list. See chapter 10 on the Player's Handbook for the general rules of spellcasting and see further down on this page for the arcane tinkerer spell list. The arcane tinkerer table shows how many spell slots you have to cast your spells of 1st level and higher. To cast one of these spells, you must expend a slot of the spell’s level or higher. You regain all expended spell slots when you finish a long rest. You prepare the list of arcane tinkerer spells that are available for you to cast and imbue them into your construct. To do so, choose a number of arcane tinkerer spells equal to your Intelligence modifier + half your arcane tinkerer level, rounded down (minimum of one spell). The spells must be of a level for which you have spell slots. For example, if you are a 5th-level arcane tinkerer, you have four 1st-level and two 2nd-level spell slots. With an Intelligence of 14, your list of prepared spells can include four spells of 1st or 2nd level, in any combination. If you prepare the 1st-level spell Burning Hands, you can cast it using a 1st-level or a 2nd-level slot. Casting the spell doesn’t remove it from your list of prepared spells. You can change your list of prepared spells when you finish a long rest. Preparing a new list of arcane tinkerer spells requires time spent imbuing your construct and memorizing the incantations and gestures you must make to cast the spell: at least 1 minute per spell level for each spell on your list. Intelligence is your spellcasting ability for your arcane tinkerer spells, since you learn your spells through dedicated study and memorization. You use your Intelligence whenever a spell refers to your spellcasting ability. In addition, you use your Intelligence modifier when setting the saving throw DC for a arcane tinkerer spell you cast and when making an attack roll with one. Your spells as an arcane tinkerer rely more on the magic you have charged within the constructs you create. Due to this your arcane focus is technically the construct itself. All of your spells are cast from the construct. Each time you gain an arcane tinkerer level, you can add an arcane tinkerer spell of your choice to your list. Each of these spells must be of a level for which you have spell slots, as shown on the arcane tinkerer table. On your adventures, you might find other spells that you can add to your list of spells. You may choose to re-roll any roll that was directly related to identifying a magical object. This ability may be used once per day and gains an additional use in the 6th, 10th, 14th and 18th level. You are now able to share your senses with your construct. You are able to see, hear and smell through your construct. This connection is valid even if the construct and tinkerer can not see each other. The only requirement to this effect is that they are on the same plane. A long time of tinkering as well as meddling in magical arts has let you build a bridge between them and gain an understanding that was somehow previously unclear to you. You may add your wisdom modifier to all intelligence checks and vice versa. You have become so proficient in imbuing arcane energies into objects that you are now capable of storing a small amount of these energies within your weapon. When you prepare spells for your construct you may also imbue your weapon with one third (rounded down) of those slots. Meaning that at for instance 5th level you are capable of storing one first level spell and NO second level spells. The spells prepared in your weapon can vary from the constructs. The imbued effect of a weapon is only potent when the weapon is held in your hand. You use your weapon as the arcane focus for casting these spells and use 8 + proficiency bonus + intelligence modifier for attack rolls. The spell save dc is 8 + proficiency bonus + intelligence modifier. Your potency over the arcane arts has given you the ability to imbue small inanimate objects with a huge amount of arcane energy. You focus this energy as a dense matter into the object so that the object becomes unstable. If anything were to disturb the peace of this object after it has been armed it would detonate and cause a huge magical explosion. This explosion deals 2d6+4 damage to the target that stepped on it, all targets within 5 feet take 1d6+4 damage and all targets within 10 feet need to succeed a dexterity check or take 1d6+4 damage as well. You use an action on your round to place the mine and arm it. Placing an inanimate object like this and arming it requires little attention from you and is not noticeable to anyone more than 10 feet away. You begin with one mine charge and gain an additional one for each 4th additional arcane tinkerer level. You also add an additional 1d8 damage for each of these levels, respectively. You have become a master of magic as well as a master of engineering. Due to this you are able to think on a level that transcends all logic. Your Intelligence and Wisdom increase by +2 and the ability score cap for these increase to 22. Most people you meet will look upon you as a genius sage that knows all. The spells in the following list can be found in Chapter 11 of the Player's Handbook, except for those marked with an asterisk, found by googling the spell name followed by 5E, for example: "Frostbite 5E". In addition to the spellcasting slots you gain from your levels you gain two cantrips of your choice at first level.